Lewis Ludlam has signed a new deal that will keep him at Saints until at least 2021. The 22-year-old back row forward is enjoying his best season to date, having started eight of Saints’ 12 matches in all competitions so far. He was hugely impressive last weekend, racking up a massive 19 tackles and 13 carries in the Gallagher Premiership win against Wasps. And news of the Academy graduate's contract renewal will be a big boost to the club. “I’m still living out my dream every day here with Northampton Saints, playing for my childhood club,” Ludlam said. “So I’m really excited to sign on again and to continue to learn from Chris Boyd and the brilliant group of back-rowers we have here at the Gardens. “It's a fantastic place to play, and I trust in Chris (Boyd) and the vision he and the other coaches have for the club. Ludlam was first picked up by Saints Academy back in 2009 at the age of 13, after stints with Ipswich and Colchester rugby clubs. He was awarded the man-of-the-match award on his England Under-18s debut, before moving into the Academy on a full-time basis in 2013 and reaching the final of the 2015 World Rugby Under-20 Championship – where he was also named England’s player of the tournament. A first-team debut followed the following season in the Anglo-Welsh Cup, while the 2017/18 campaign saw Ludlam not only score on his first Premiership start, but also help the Wanderers claim their second straight Premiership Rugby A League title. 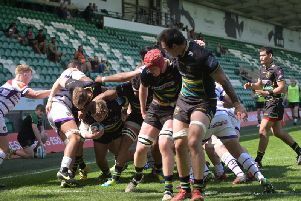 But this season has seen Ludlam really burst into the spotlight at Franklin’s Gardens, making a breakthrough under director of rugby Boyd, who is confident the flanker will continue to flourish at the club. “Lewis is clear proof that our Academy system is thriving here at Northampton Saints," Boyd said. “I’m delighted that he has committed his future to the club; part of improving the squad here in Northampton means nurturing a backbone of home-grown talent.